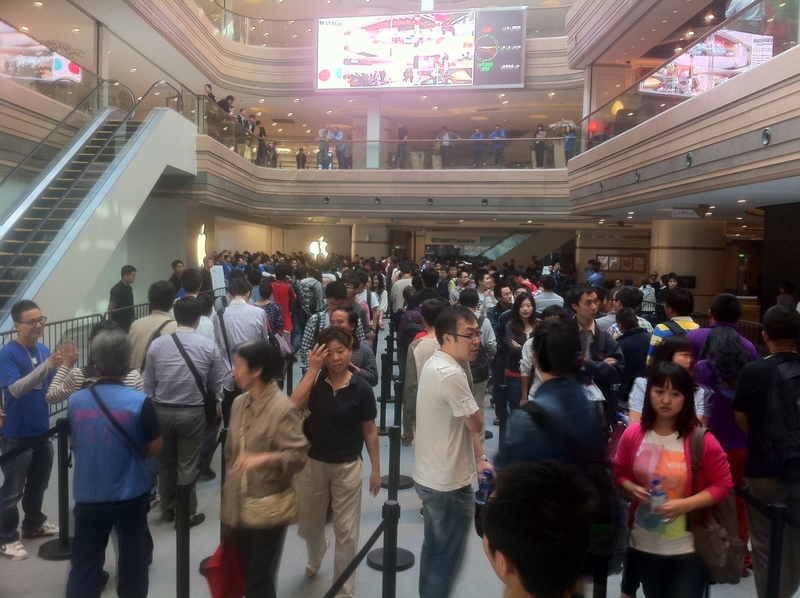 Scenes from Shanghai this morning, where Apple opened its third store. Photos by reader Jeffrey. Click for larger. Apple’s enormous and beautiful Nanjing East store in Shanghai opened doors to business this morning. If the images depicting the enthused crowd are anything to go by, this could become one of Apple’s top revenue stores. The Nanjing East spot is Apple’s third retail store in Shanghai and sixth in mainland China, if you include the upcoming monster store in Honk Kong’s IFC center. The Nanjing East spot is located within the massive wide building located at the corner of Nanjing Road East and Henan Zhong Lu. Apple couldn’t have chosen a better place to build this store: It is within walking distance of the city’s famous skyscraper panorama and right within The Bund, a major tourist attraction consisting of the wide avenue of historic buildings. It spawns four levels of retails and the fifth level for backend operations. Sales are on a ground floor, a second floor for product demos, sales and training, while the third, fourth and fifth floor house backend operations and support for business customers. In addition to the Nanjing East store, Apple will tomorrow open six new stores on four continents: Canada (the Metrotown store), Australia (the Westfield Hornsby store), France (the Parly 2 store), Italy (the Centro Sicilia store) and the United States (the New Haven store). In total, Apple will end the September quarter with 27 store openings, just three stores shy of its self-proclaimed goal of thirty new stores by the end of September. Fortune’s Philip Elmer-DeWitt dug up two video clips of the Nanjing East store opening, included below (the other video is right after the break).